I finally went through all the old clothes stuffed in the wee tot’s drawers and found so many onesies full of stains and stuff. Sure, they were clean, but they had endured the wonders of baby-hood and were ready to move on to the world of Goodwill. But, before dropping them off, I pulled a couple that I had other plans for. My daughter loves bags. She turns pretty much anything into a carrying implement and then attempts to shove as much stuff into it as possible. She’s transformed the husband’s socks, an old ring box, and even wrapped paper towels into ways to carry all her goodies. I knew we could turn that onesie into something fun she could proudly trot around with. But, we had to do something about those stains first. So, we got out a few simple materials and got started. 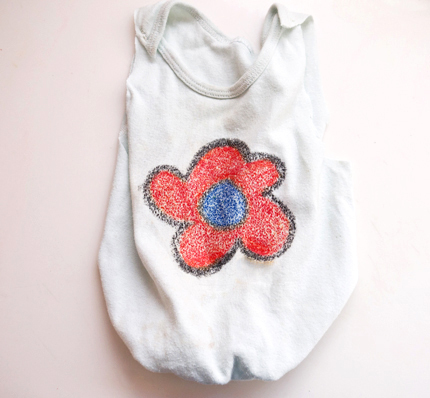 This is a great project for old t-shirts, too! And, the younger set, aged four and up, can have fun with this (even the adult ones). In fact, I really got into making a few old t-shirt bags for myself to carry our groceries. Start by finding a random piece of sandpaper from the garage. Any type will do, so don’t be fussy. Cut a square out of that sandpaper making sure it fits on the front of the plain onesie or t-shirt. Your child can get out a ruler and do all the measuring, which encourages her budding math skills! Now offer lots of crayons and get coloring! Your child can draw a random design or a detailed picture. Encourage her to press hard, which will ensure a nice bright crayon transfer. 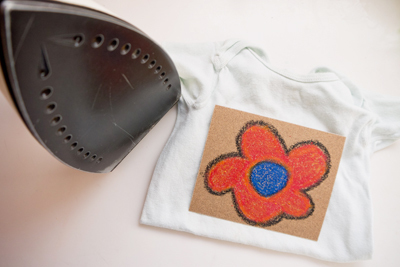 While she’s coloring away, start heating an iron for the transfer process. This part can be tricky for kids, so offer some adult supervision. No one wants to get burnt when creating a fun art activity! Pop a piece of folded paper between the sides of the onesie or t-shirt and then position the sandpaper, crayon side pressing against the fabric. 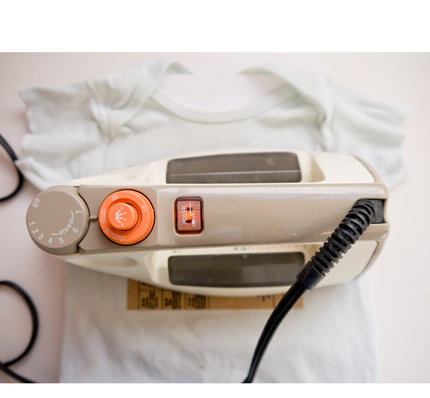 Place the hot iron on top and slowly move around the square for about 30-seconds. Let the sandpaper cool for a minute and then remove, revealing the crayon transfer. To finish the bag, invite your child to cut the arms off the onesie or t-shirt, along with cutting along the middle section, removing the bottom of the onesie. If you are using a t-shirt, all your child has to do is trim off the arms. Offer your child a big craft needle and a length of string. She can secure the upper shoulders of the onesie (which will cut open when the arms are cut off – no big deal) and then turn the onesie or t-shirt inside out and do a simple straight stitch along the bottom. If she’s using a t-shirt, she can follow the bottom seam of the shirt. Once your child reaches the other side, she can gently pull the string, gathering the bottom edge of the shirt. Encourage her to tie the string tight and then turn the bag right side out and check out her finished product!